Want more sailing time or a different route? 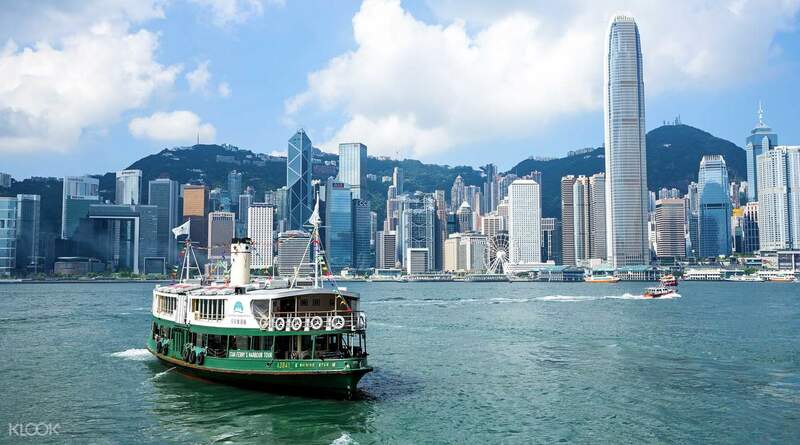 You can also join the Star Ferry Harbour Tour for four different routes! Very spacious and clean with less than 10 people. You can go from another less crowded route and take pictures along the way. Need to find the right counter to redeem. The staff will shout out at the boarding, waiting area around 10.55am. If you're in Hong Kong and traveling to Disneyland, then the best way to make the most of your trip there is to try the Star Ferry transfers! Created for tourists and locals alike to be able to experience an entirely different way of getting to Disneyland, the sea voyage boasts impeccable views of the city harbor and skyline. And as a bonus if you take the later voyage, you get to catch the sunset on your way to Disneyland or back. All you have to do is show up at Tsim Sha Tsui Star Ferry Pier, exchange your vouchers for tickets and the memorable roundtrip transfers are all yours to enjoy! 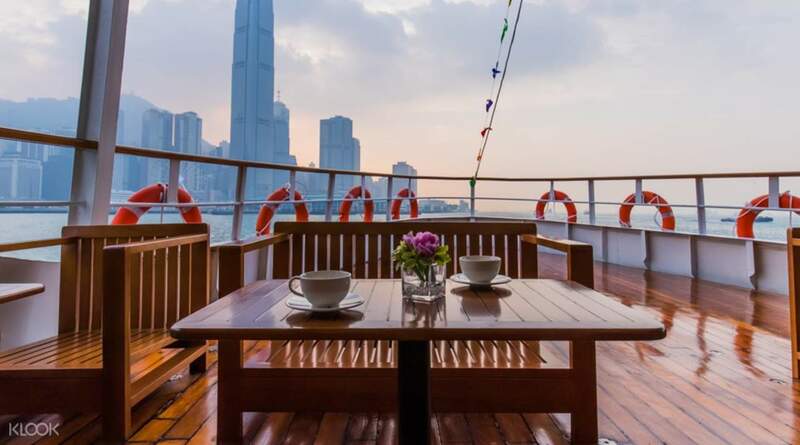 Once you're aboard the Star Ferry, you can enjoy refreshments from the air conditioned cafe, or hang out in the open decks to soak in the breeze, the sun and the smell of the ocean while on your way to the happiest place on earth! Board the ferry at Tsim Sha Tsui Star Ferry Pier, exchange your vouchers for tickets and off you go! Return from the special designated pier at Disneyland! The trip was worth it’s price. It’ll tour you around hong kong, will take you to disneyland and has snacks along the way. The view is also breathtaking! The trip was worth it’s price. It’ll tour you around hong kong, will take you to disneyland and has snacks along the way. The view is also breathtaking! A fun experience and way more interesting to get to disneyland other than mtr.you can take loads of photos of the hong kong island.remember to redeem your free drink n biscuits onboard. A fun experience and way more interesting to get to disneyland other than mtr.you can take loads of photos of the hong kong island.remember to redeem your free drink n biscuits onboard. Very spacious and clean with less than 10 people. You can go from another less crowded route and take pictures along the way. Need to find the right counter to redeem. The staff will shout out at the boarding, waiting area around 10.55am. Very spacious and clean with less than 10 people. You can go from another less crowded route and take pictures along the way. Need to find the right counter to redeem. The staff will shout out at the boarding, waiting area around 10.55am. The boatride was great. You get to see Hong Kong and take great pictures. It takes about an hour to get to Disneyland and while on the boat you get some information and history. The only problem with this trip is that nothing is clearly marked at the pier. Some people didn't know where to go and where to get the tickets. 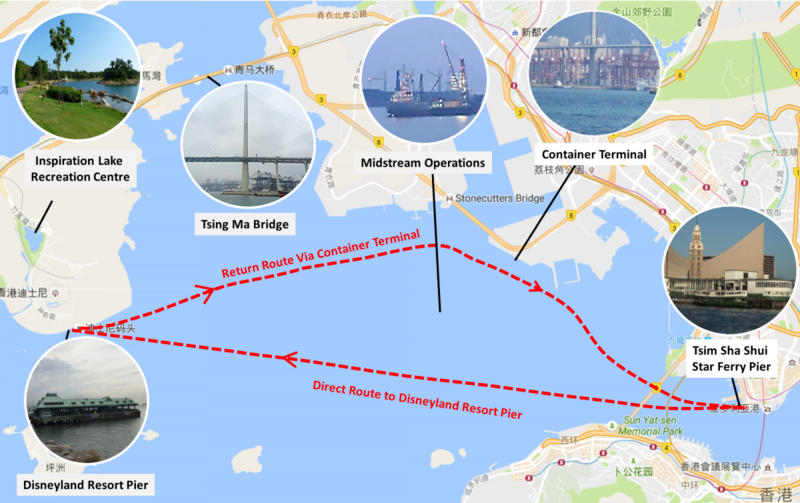 Make sure to go to the end of the pier marked "star ferry harbour" as nowhere will be marked Disneyland. The boatride was great. You get to see Hong Kong and take great pictures. It takes about an hour to get to Disneyland and while on the boat you get some information and history. The only problem with this trip is that nothing is clearly marked at the pier. Some people didn't know where to go and where to get the tickets. Make sure to go to the end of the pier marked "star ferry harbour" as nowhere will be marked Disneyland. The kiosk opens only at 10.20am, so no use going so early. It is a bit hard to find. 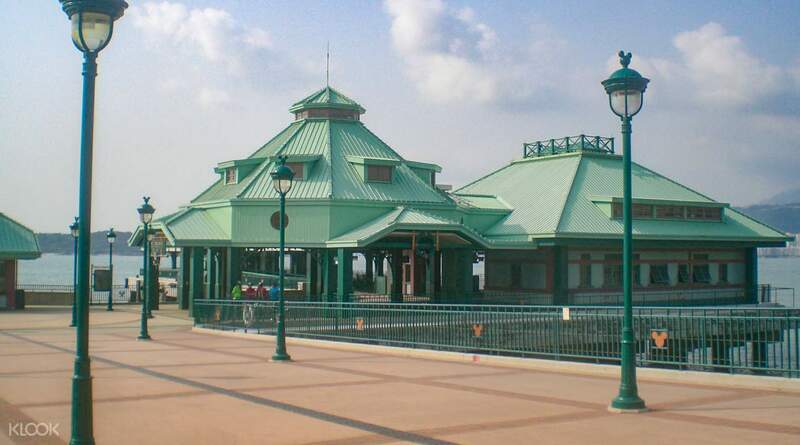 It is near to the pier side.I have attached a pic of the kiosk for reference. If u still can't find it u can ask any of the staff at the tourism board office. The kiosk opens only at 10.20am, so no use going so early. It is a bit hard to find. It is near to the pier side.I have attached a pic of the kiosk for reference. If u still can't find it u can ask any of the staff at the tourism board office. It was an spectacular experience.. easy to locate and not that crowded.. Disney Pier Terninal is just near from Disneyland hotel.. we enjoyed everything.. the complimentary snack, the view along the way, the ambiance of the Ferry, clean and spacious.. you feel special trip while on board.. It was an spectacular experience.. easy to locate and not that crowded.. Disney Pier Terninal is just near from Disneyland hotel.. we enjoyed everything.. the complimentary snack, the view along the way, the ambiance of the Ferry, clean and spacious.. you feel special trip while on board.. The taste of salty air, you just got to love it. lol Service was actually good, you have the option to stay indoors since it's airconditioned or at the balcony where you can get a better view and smell the the salty air. The taste of salty air, you just got to love it. lol Service was actually good, you have the option to stay indoors since it's airconditioned or at the balcony where you can get a better view and smell the the salty air. Is such a beautiful experience and hassle free from dragging all the luggages from Kowloon to Disney land . Sailing was smooth and easy except for one flight of stairs we needs to take .patents with young children and elderly with assistance May face difficulties. Is definitely worth than taking mtr. However We didn’t know is a 2 ways . Only needed one way . So is kind of wasteful . Is such a beautiful experience and hassle free from dragging all the luggages from Kowloon to Disney land . Sailing was smooth and easy except for one flight of stairs we needs to take .patents with young children and elderly with assistance May face difficulties. Is definitely worth than taking mtr. However We didn’t know is a 2 ways . Only needed one way . So is kind of wasteful .